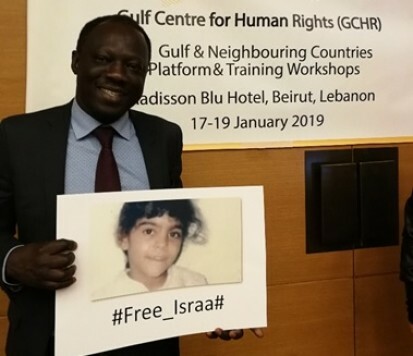 The Gulf Centre for Human Rights (GCHR) welcomes reports that woman human rights defender Israa Al-Ghomgham is no longer facing the death penalty after international pressure forced Saudi Arabia to restructure the Specialised Criminal Court (SCC) in Riyadh, where she is being tried. A new trial date is expected to be publicised soon, and she is still likely facing a lengthy sentence for engaging in peaceful protests in 2015. The case has generated a lot of interest internationally because during the first hearing in the case on 06 August 2018, the Public Prosecutor originally called for Al-Ghomgham’s execution by beheading, making her potentially the first woman to be executed for her activism in the country. The news followed an intensive international campaign that forced authorities to reconsider her case. Her most recent trial date on 13 January 2019 was postponed because the SCC is being restructured, with a new head of Court, Deputy and most likely new Judges. The SCC was created in 2008 to deal with terrorism cases and GCHR has repeatedly called for an end to its use to prosecute human rights defenders for their peaceful activities. Al-Ghomgham wasn’t in court. The UN experts are special rapporteurs (SRs) Clément Nyaletsossi Voule, SR on the rights to freedom of peaceful assembly and of association (pictured above); Michel Forst, SR on the situation of human rights defenders; Diego García-Sayán, SR on the independence of judges and lawyers; David Kaye, SR on the promotion and protection of the rights of opinion and expression; Dubravka Šimonović, SR on violence against women, its causes and consequences; Fionnuala Ní Aoláin, SR on the promotion and protection of human rights and fundamental freedoms while countering terrorism; Ahmed Shaheed, SR on freedom of religion or belief; Agnes Callamard, SR on extrajudicial, summary or arbitrary executions; and members of the Working Group on the issue of discrimination against women in law and in practice; and the Working group on arbitrary detention (WGAD). Al-Ghomgham remains in the General Intelligence Prison in Al-Dhamam, where she has been held since her arrest on 06 December 2015. GCHR calls for her to be transferred to a general prison, and for guarantees for her health and well-being, which have suffered in the past. She must also be given full access to her family and a lawyer of her choosing. Guarantee in all circumstances that all human rights defenders in Saudi Arabia, including women’s rights defenders, are able to carry out their legitimate human rights activities without fear of reprisal.